Why Would You Need To Demand Something? We’ve seen a lot of news this last week regarding fast food workers demands for $15 per hour. Wikipedia defines demands as “A Demand is a buyer’s willingness and ability to pay a price for a specific quantity of a good or service”. Let’s look at this for a minute and see how this plays out. Since these workers don’t own the place they’re working it seems to me that the owner is the buyer of the labor and the worker is the seller of that labor. This should explain everything, but for a few this still falls short so let’s go a bit deeper. When I worked at McDonalds as a whopper flopper it was 1971. I was sophomore in high school and I was pretty clear even than that this was not a career path I was going to remain on. I was making $1.65 per hour, I was in high school and I was living with my parents. I felt like I was doing well and even then I knew there was more. To get to the next level I stayed in school, did not have children, did not smoke or do drugs and didn’t buy a new car. I know that it terms of today, I over sacrificed. In my terms I simply went through the required actions to have the choices I currently enjoy. Yes I spent a fortune on an education. Yes I took risks starting all 5 of the businesses I’ve had. Yes each of my businesses has succeeded. Yes I work more than 40 hours every week. Yes I read to stay ahead of the market and trends. Yes I work weekends. Yes I know that almost everyone who reads this blog will say Yes, so do I! If these workers truly want $15 per hour, and who can blame them, they need to bring more, much more to the table. We find it funny when they ask a low education voter a question about history or even current events and the answers they give aren’t even close to correct. I believe that is where these folks get many of their screwed up ideas. 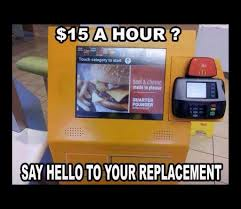 They believe that they deserve $15 or more per hour for just showing up, they deserve weekends off, they deserve sick days and even a paid vacation. They learned a lot of this when they got a trophy for taking up space on a soccer team that never won any games. Few reading this will disagree with any of this. Few would change the concept of you get a trophy when you earn the trophy! Their current trophy demand is $15 per hour and they are unhappy with the idea of judge me on what I produce” while you and I are fine with that. No one I know has made any money playing a video game, texting their friends, playing on Facebook or any of the other wastes of time they willingly pursue. Read a book, attend a class in something saleable, get some advanced training or in other words make yourself more valuable. That $15 per hour position might be right around the corner and from what I know of the people I serve, if you ask for more training the person who hired you might just send you and pay for it! However, if they faint when you ask, give them a pass as it might just cause that! What We Know That Just Ain’t So! I keep pinching myself to make sure that I’m awake every time I get to spend time reading and applying what I read to the business of both my clients and myself. Something I see almost daily is someone who has a strong opinion about something that just isn’t accurate any more. We all live in a world where people cannot pull themselves away from their phone, tablet or even desktops. There are still people who minimize this audience and refuse to take advantage of it. While I am the first guy to grab the phone book I also know that none of my kids (21, 21 & 25) even know how to use a phone book. They have never needed to use one so why learn. This goes for almost everyone under the age of 40! The problem grows with the size of the city. The smaller the city the greater the phone book use and vice versa. Since I have never played a video game I know that I am not what most people are going to market to. I’m not a fan of the internet and really have no idea how it all works. I also have no idea how the electric light works or even the computer I am typing this on. I know these are tools and I know how to use them. Understanding these tools is a different topic altogether. When I need to know there are an almost unlimited number of ways to gain that knowledge and then apply it. I start with books and others start with YouTube or Google. The reality is that we must start and we must continue. Where does your journey begin? If you aren’t sure about your current journey or have yet to start give me a call. 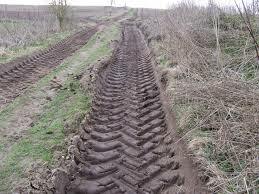 There are road maps available and the secret is to find the map that works for you! My name is Steven Clauson and I can be reached at 916-230-0176 or at www.assaultmarketing.com I Can Help! There was a homeowner interviewed Sunday night after the quake in Napa whose home was devastated. The garage floor was buckled and there was a crack running along the entire home. 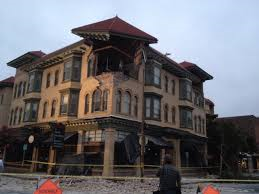 Sadly, his family home is not fit to be lived in any longer and will likely be leveled. Just a horrible result and from what he said, it was predictable. He had friends over from his church and they were moving everything out of the home prior to the home being red tagged as unfit for entry. The homeowner went on the say that even though he signed papers when he bought the home stating that he lived literally on top of an earthquake fault he still made the wise choice to NOT buy earthquake insurance. He knew that the fault existed and still chose to avoid that wise purchase. After saying that he wished he had bought the coverage he was now EXPECTING FEMA to come in and make things right. Somehow his unwillingness to buy earthquake coverage when he lives on top of an earthquake fault is now the Federal Governments issue. Just a bit shortsighted and sadly commonplace. This has become the average individual in our land. They expect to get bailed out of their bad decisions and they typically do. This is who most of us have to deal with on a daily basis. Did personal responsibility ever exist in his world and if he doesn’t have it now, is there any chance his children will somehow learn it somewhere? Doubtful at best. One of the best aspects of my professional life is that I get to work with committed people that have loads of personal responsibility and are always working towards “what’s next?” If this is you I want to talk to you. If you have the courage to define what your world looks like we should meet and get to know each other. My name is Steven Clauson and I know how short life really is. Let’s talk before short turns into gone. Call me at 916-230-0176 or visit me at www.assaultmarketing.com and let’s see what your next level looks like. My coach sent me a link to a web site recently that encapsulated I lot of what I coach and a lot of who I am (sometimes simply who I want to be). The link he sent lead me lead to a YouTube channel called “Because I said I would”. The premise of this channel is simple… This is a group of people that do something because they said they would. This agreement can take a lot of forms. I am going to reveal a failing I had until I saw this site and looked at my behavior. I am one of those people that you love to hate in that I text and drive at the same time. I have had the conversation with myself that I know what I am doing so it’s ok for me. This is the mantra of everyone who does anything that is stupid and yes, this behavior is stupid. I had the conversation with myself that I would never do this again and I won’t… Period. I won’t because I said so. This was actually hard to look at initially and it got easy fast. We all expect people to do what they say they will and adult adult’s get this done. I now have this done because I said I would. What are you doing because you said you would? What Can We Learn From A 16 Year Old? 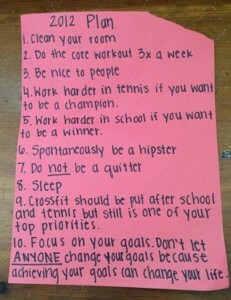 Did I mention that 16 year old girl that wrote these goals a little over 2 years ago, Bridget Guenard went on to earn a scholarship to West Point, is a nationally ranked Tennis Player and Champion and was offered multiple full ride scholarships to other universities based initially on her academic excellence and then on her athletic ability? Did I also mention that she is one of the nicest people you could ever hope to meet? Please reflect on these goals. These are HER goals and she did not get help from her parents or coaches when she wrote them and her father Glenn Guenard happened upon them recently and gave me permission to share them with you. What I see is work, not quitting, having fun, being a nice person, having fun (I said it again) and the fact that goals can change your life and the lives of those around you. Again, this was all written by a 16 year old who now attends The Military Academy at West Point. 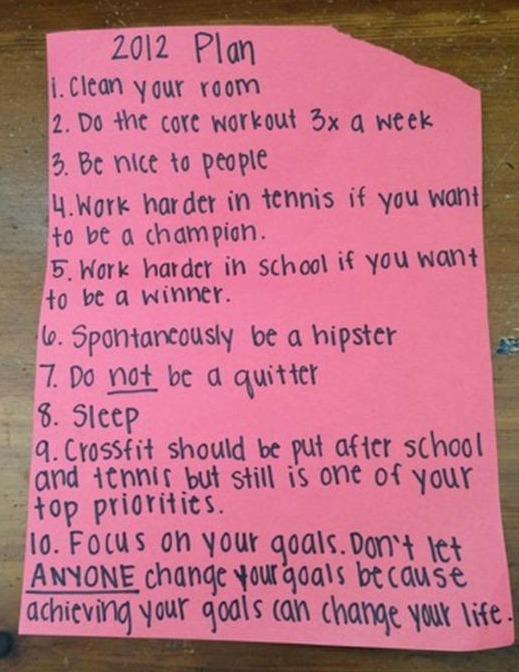 Some are basic points like “clean your room”, some are fun points like “spontaneously be a hipster” and the final point of “focus on your goals and don’t let anyone change your goals because achieving your goals can change your life”. This girl will accomplish much in her life because she is setting reasonable goals and has them in writing. She has been a lifelong learner and will dictate her results a not take a wait and see point of view. I will write again about Bridget as she proceeds through West Point and until that time I have to ask you “What do you have written down and who are you sharing it with?” It matters more than you know. At one point in time Abraham Lincoln said that the person who can read and chooses not to is no better off than the person who cannot read. Why have so many people made the choice to stop learning once they completed school at whatever level they stopped at? This is a puzzler! The half life of radiation is that point at which 50% of it effective life has dissipated. For most elements that is measured in dozens of years. Most people are unaware that education has a half life as well. In 1960 the half life of education was assumed to be about 35 years so that means in 35 years half of what you know has been replaced by new and better information. In 2012 the half life of education was assumed to be 23 MONTHS! That means that in 23 months half of what you know has been replaced by new and better information. What new information have you taken on to keep current and them replace the half you lost? If you aren’t reading a book of substance you are falling behind. There is a book out now called The Slight Edge… Turning Simple Disciplines Into Massive Success And Happiness by Jeff Olson. Get it, read it and take the results to the bank. The bakery world was on fire for about 8 years with cupcakes. It seemed that if you were a bakery you made cupcakes and you were taking bushels of money to the bank. In the investment world everyone loved investing in the next great cupcake. Many bakeries almost forgot how to make anything else… In fact many bakeries stopped making everything else in favor of the cupcake. It seems that even America has finally grown tired of the venerable cupcake! Krispy Kreme. This company is 77 years old and has lost almost 100 locations in the last 10 years. Nothing but donuts! Mrs. Fields. Had a peak of 438 stores and it is now down to 230. Just expensive cookies. TCBY. While it may be The Countries Best Yogurt it is still yogurt and the popularity of yogurt proves that marketing works! TCBY is down to 355 stores from a peak of over 1400! Yogurt? Seriously? There are other companies that are fighting hard to expand their menus to grow market share. Dunkin Donuts is working to expand their coffee line and specialty sandwich line and they are doing this because it gets a little quiet after the morning donut run is complete. Starbucks is working the specialty sandwich angle as well and they are also planning some beer and wine offerings soon to have a reason to keep stores open. Both of these companies are gaining ground for now. Whenever I look at any company one of the first questions I ask is “Since I know what they sell I wonder what else they could sell to their same market?” This is a great question to ask and continue asking. Sometimes the best people to ask are the ones that come face to face with your customer. I wonder what they have to say and when they were last asked? My name is Steven Clauson and my Company is Assault Marketing. Call me at 916-685-7330 or at www.assaultmarketing.com We do it for you or work with you 1 on 1. We Can Help! This is going to be really quick… The year will be halfway complete by midnight. 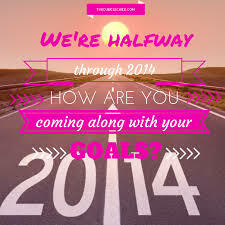 Are you halfway to the goals you set on January 1, 2014? If not we need to talk. 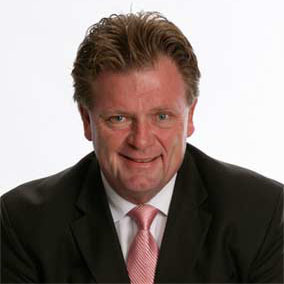 My name is Steven Clauson and My company is Assault Marketing. Call me personally at 916-685-7330 or visit my website at www.assaultmarketing.com I Can Help You.